Contributes to normal metabolism of fatty acids. 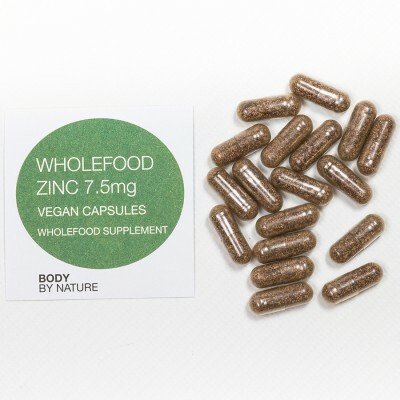 Zinc plays an essential role in the support of the body’s defence system. Among many of its functions, it helps to maintain growth in skin, nails and bones. Zinc also contributes to normal cognitive function, to normal carbohydrate and macronutrient metabolism. Necessary for over 100 different enzyme systems in the body.These supplements are made from plants NOT synthetic chemicals like other brands. Being the second most abundant trace mineral in the body, you will find zinc in all the bodies tissues. Being a trace element it provides vital help for things like the prostate gland, healing of wounds, proteins and acids. Whole-food Zinc is made from hydroponically grown brassica (a member of the broccoli family). This edible species of brassica is perfect for generating supplements where higher levels of minerals are required than would normally be available in the food we consume. Body By Nature provides this essential supplement by way of an easy to swallow capsule. Aids normal protein synthesis. Preserves hair, bones, nails and skin. It is also crucial for normal foetal development. Zinc serves as a primary role in the formation of collagen as well as the development of healthy tissue. Adds to the preservation of normal serum testosterone concentrations. Protects cell constitutes from oxidative damage. Zinc deficiency is very common in vegetarian diets, so it can be beneficial for Vegetarians. A key antioxidant mineral for maintaining the immune system. Adds to both normal metabolism of fatty acids and acid-base metabolisms. Impacts on the normal cognitive function. Hydroponically-grown cruciferous vegetable (Brassica juncea) providing zinc, capsule shell (hydroxypropylmethylcellulose). Yeast, wheat; starch; gluten; added sugars, colourings, flavourings & preservatives.